There’s a type of action movie that requires a lot of its audience. You have to suspend not just your disbelief, but also your common sense. If you’re willing to do that, it’ll give you the ride of your life – but if you’re not, you are in for an unpleasant time. “Olympus Has Fallen” is definitely this type of action movie. 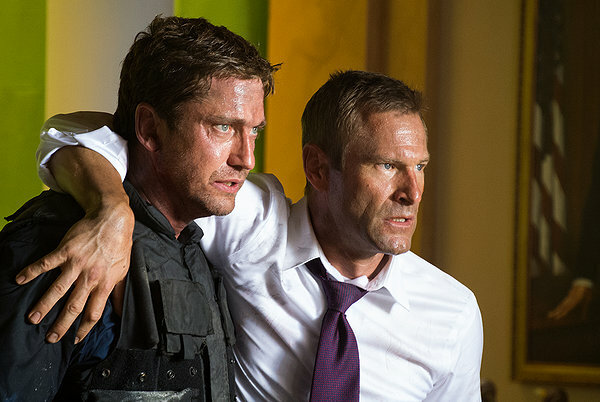 A group of North Korean terrorists take the White House, holding the President (Aaron Eckhart) and several other executives hostage in the emergency bunker and killing off the entire Secret Service and all other security personnel sent to stop them – except for one Mike Banning (Gerard Butler). Banning is the greatest Secret Service agent ever, and was close to the President until a tragic event occurred and he was booted to a desk job. With Banning the only living, non-captured good guy in the White House, Acting-President Speaker Trumbull (Morgan Freeman) and the other free executive and military folks have to rely on him to save the day. Apparently the Marines, all S.E.A.L. teams, the Air Force, etc. are all on vacation. Or Kang (Rick Yune), the leader of the terrorists, is scary enough that Trumbull won’t send them in? It’s not clear. It’s also not clear why the Acting President is behaving as though saving the person who was the President is more important than preventing the huge apocalyptic thing Kang is trying to do. Presumably someone pointed out to him that then the movie would be very short. Yune makes a solid villain, although he isn’t given much to work with. Kang, we learn, is a sort of super-terrorist who hates the US because his mother was killed by an American land mine. He turns out to actually have a decent plan, once we find out what it is, but it relies on the president being empathetic to the point of incompetence (which he is) and the security design of the American military being astonishingly bad (which it also is). If you’re willing to turn your brain off, there’s a fair bit of action to keep you entertained – but it takes entirely too long to get going. A prologue involving Banning’s fall from grace takes up twenty minutes when it could have been told entirely in brief flashbacks, and keeps anything interesting from happening unless you count dialog, people dressing for a party, and a limo spinning out on black ice as interesting. Big, dumb action movies like this need to get off to a rip-roaring start, and this one definitely does not. Once it does get going, though, there’s a lot to like. Butler makes a decent action hero and there’s lots of gunfire and explosions to enjoy (even a huge plane crash!). If you’ve seen one or two of this type of flick, you’ve seen ‘em all, and this one is no different. Whether you’ll like “Olympus Has Fallen” or not depends on how demanding you are of your big, dumb action movies. If you can’t deal with slow starts or massive plot holes, stay far, far away from this flick. If, on the other hand, you don’t mind a slow start as long as there’s enough action to make up for it later, this is probably a good matinee or second-run choice.